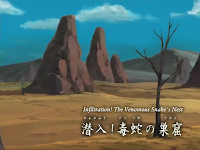 hi guys, here is 47th episode of naruto shippuuden series "Infiltration! The Venomous Snake's Nest". This episode reveals how Captain Yamato team find where Uchiha Sasuke is and how they infiltrated into the hide-out. There is also little chat between Sasuke and Sai. It is divided into two parts for ur convenience. English Subbs are provided. Download: part1, part2.